This companion Pocket Part issue to the main article shares with readers digital images of some of the original court archives. Most of the courts’ decisions and a substantial part of the correspondence between the judges and the British government are summarized in the published British Parliamentary Papers. But the original, handwritten court records are housed at the United Kingdom National Archives outside London. These handwritten records give a more human sense of the courts’ operations, and their impact on individual lives. One of the criticisms of modern international criminal courts is that they afford too little role and respect for the victims of human rights abuses. The same appears to have been true of these much earlier courts. In the official court records of the antislavery courts, the individual slaves liberated from the captured ships are often almost invisible, described only in raw numbers—so many hundred men, women and children. 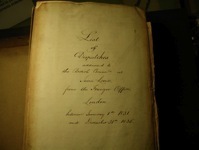 But elements of these human stories appear here and there in the records—in the logbooks listing each of the tens of thousands of liberated slaves by name, age, height, and description, or in letters describing the work of court officials to ensure the health, safety, and liberty of these individuals. The following sections connect the reader with a very small sample of the original documents from the antislavery courts. Jenny S. Martinez is Associate Professor and Justin M. Roach, Jr., Faculty Scholar at Stanford Law School. Preferred Citation: Jenny S. Martinez, Antislavery Courts, 117 Yale L.J. Pocket Part 160 (2008), http://yalelawjournal.org/forum/antislavery-courts.